RUSH: Audio sound bite time. This afternoon, CNN Inside Politics. I’ve detected something. CNN, I think they monitor this program all the time. And when they hear something they think they can put to good use for their agenda, they do it. And, of course, they like playing sound bites from this program ’cause it’s a good show and they like getting intelligent sound bites of the stuff they disagree with so they can have their brain-dead analysts analyze it. And that’s what happened here. John King. This is from, actually, yesterday’s show, my comments about Trump not firing the special counsel, Robert Mueller. KING: Let’s listen quickly to Rush Limbaugh, who makes the point: Mr. President, you know, we’ve done a pretty good job undermining confidence in Mueller. RUSH: Hold it a second! Hold it a second! Wait a second! What did he say there? He said, “Let’s listen quickly to Rush Limbaugh, who makes the point: Mr. President, you know, we’ve done a pretty good job undermining confidence in Mueller.” He thinks that I’m saying what I said yesterday as a message to Trump? Holy smokes! I missed that reading the transcript. This is incredible. 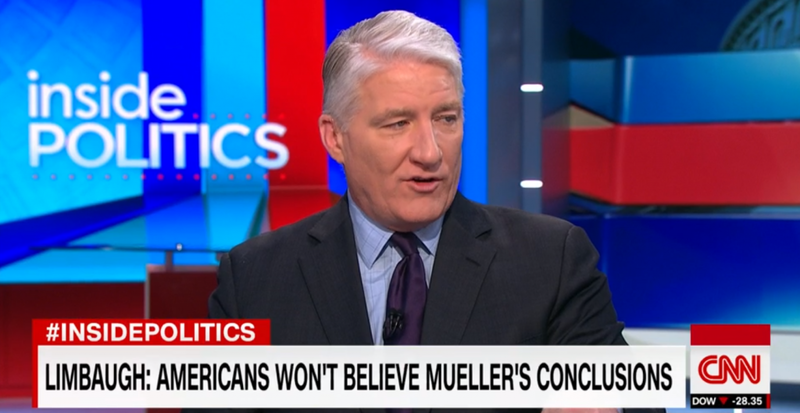 So John King is alleging that I am signaling Trump not to fire Mueller because I’ve already done a good job of destroying Mueller! So I’m urging Trump not to make the mistake of firing him! Good grief! Okay. You got it cued from the top? Here it goes, again. Sound bite 24. 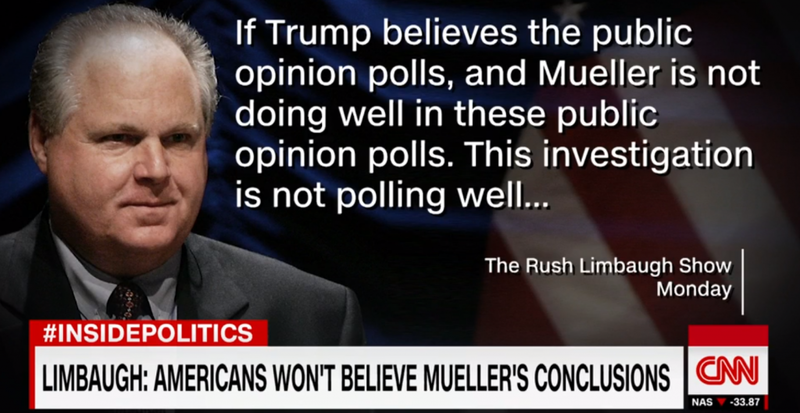 RUSH ARCHIVE: If Trump believes the public opinion polls — and Mueller’s not doing well in these public opinion polls — this investigation is not polling well. … If Trump believes that whatever this investigation produces that 45, 48% of the American people are not gonna believe it, why tamper with that? KING: That’s a misconception I would say there between a political conversation about what might happen and if the special counsel comes forward with… He already has two indictments and two plea deals. KING: If he comes forward with more specifics — in a court of law, not a court of political spin — that changes everything. RUSH: This is insane. I can’t believe this line of thinking! First off, I haven’t spoken to Trump since March 23rd. Trump does not listen to the radio. Trump has no idea what I’m doing or what I’m saying or where I’m going or any of that. And yet these people think that I am sending Trump a message here, “Don’t fire Mueller because I, Mr. Trump, have been doing your dirty work and I’ve ginned up enough opposition to Mueller that you don’t need to worry about it.” How in the world…? What kind of existence creates that timeline or thought process? “Here’s Rush Limbaugh making the point: Mr. President, you know, we’ve done a pretty good job undermining confidence in Mueller.” I didn’t address anything I said to Trump! As always, I’m telling you that. I was saying, “I don’t think Trump’s going to fire Mueller.” I wasn’t saying, “Mr. President, don’t do it, don’t do it!” I was saying I don’t think he’s going to. I don’t have the foggiest idea what he’s gonna do. I’m just pointing out that if 50% of the people think Mueller’s investigation is bogus, don’t tamper with it. They think that I’m subliminally talking to Trump or directly talking to Trump trying to make sure he doesn’t make a mistake, and then at the end of this: “That’s a misconception I would say there between a political conversation about what might happen and if the special counsel comes forward with… He already has two indictments and two plea deals.” John, the indictments and plea deals he has have nothing to do with collusion! The Manafort stuff happened before the campaign. Mueller doesn’t have anything! LEE: You know, not to put him on the couch too much, but I do think it’s just this perfect telling example of how he is so able to build this fortress around him and believe exactly what he wants to believe. You know, there’s no clear indication that the Mueller investigation is slowing down or nearing an end. In fact, it is clearly deepening; it is broadening in scope. But the president is choosing to believe that he’s going to be exonerated sometime soon. And I think his advisers and his allies have every reason to be concerned about that. These people! You clowns are the ones that don’t have any evidence! Good God. It’s been over a year, lying sources, made-up sources, blind sources, anonymous sources, not a shred of evidence yet. And yet they live in this hope and dream that there’s gonna be that silver bullet, that evidence, that one smoking gun that’s just gonna nail everything. And you’d think, after looking for it for a year, do they not understand that all this has been made up? The Trump dossier (which they’re all buying into believing) was made up! RUSH: Here is Rodney, Port St. Lucie in Florida. Hi, Rodney. How are you doing? CALLER: Hey, Rush. I’m doing great. Thank you, and thank you for the comments before because you led me perfectly into what I wanted to talk about because there’s been something that’s been totally bugging me about this whole Mueller investigation. So I have a question for you, Rush. How long have we been hearing from insider sources, unnamed sources, anonymous sources, et cetera, that Trump was gonna fire Mueller? Pretty much since day one, right? CALLER: And how long has Trump, people inside the Trump White House been saying that’s not true, that’s not true, don’t have any intentions of firing him. CALLER: No actually, Rush, I think what’s been happening from what I’ve been reading is now they’re daring him too. RUSH: Well, yeah. I’m saying that’s what they’re saying. I don’t think Mueller is gonna be fired. CALLER: No. I don’t, either. This is when I think the lightbulb went on for me. So now it’s going from he’s gonna fire him to, “He better not fire him. He better not fire him. We’re gonna take to the streets.” So here’s what my thinking is. I can’t get to the endgame. What is the endgame? And so because nothing has come out of this whole witch hunt to implicate Trump, the only people that are gonna be implicated seems to be the FBI, the Department of Justice, establishment, the deep state, Hillary Clinton’s campaign, so why in the world would Trump want to stop it? I would think the person that wants to keep it going is Trump. And that’s when the lightbulb went on for me. So here’s my theory, and I want to know what you think about it. I think that all these talking heads are basically goading Trump, they’re just daring him, ’cause they know that Trump likes to poke his finger in their eye. They know that he likes to drive them crazy, so I think they’re hoping that he does because they know there’s nothing there on collusion, except for on their side. So then if that happens, then I believe that they think that they can change the whole narrative of the investigation from one of collusion to obstruction. That’s when I said — you know, I was reacting to Trump, not sending him a super-secret message, John King. 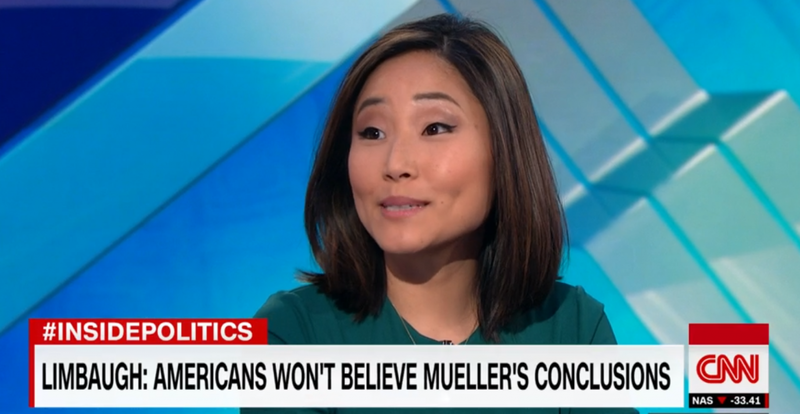 When Trump he said he wasn’t gonna fire Mueller, I said, “Why should he. Forty-five, 48% of the American people don’t trust the Mueller investigation anyway.” By the way, the investigation has not turned up any dirt on the FBI. We have. The inspector general has found the dirt on the FBI. But the Mueller investigation hasn’t exposed any of its own dirt. This investigation is not looking into Mueller’s team and how they’re screwing up. We just have found out that they are. This investigation is what it has always been: Put together a case that the Democrats can use to impeach Trump if they win the House next year. That’s what this investigation is. There isn’t any collusion. And even if they found some, it’s all gonna go into it “to be impeached” file. That’s all this is. That’s how it started. That’s how it continues. 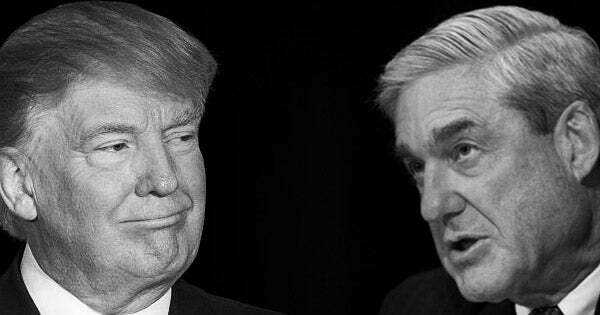 The idea that Trump is gonna fire Mueller is something they cooked up. That begets discussions on cable news, “Can Trump, should Trump?” I have no doubt they would love for him to because that they think would make their case that Trump’s obstructing them. But I just don’t see it. But who knows? You know, at this point I don’t know whose counsel weighs the most with Trump. But I can’t imagine people closest to him urging him to fire Mueller, just based on this stuff. This stuff, we’re already learning, there’s still more to learn, the IG full report’s gonna be coming soon. And we’re gonna learn much more than just these texts.